G. Robles, M. Sánchez, R. Albarracín, M.V. Rojas, E. Rajo, J.M. Martinez-Tarifa, Antennas parametrization for the detection of partial discharges, IEEE Transactions Instrumentation and Measurement, Vol. 62, Issue 5, pp 932-941, May 2013. Abstract – Partial Discharge (PD) detection is a widely extended technique for electrical insulation diagnosis. Ultra High Frequency (UHF) detection techniques appear as a feasible alternative to traditional methods thanks to their inherent advantages such as the capability to detect partial discharges on-line and to locate the piece of equipment with insulation problems in substations and cables. In this paper, four antennas are thoroughly studied by means of their theoretical and experimental behavior when measuring electromagnetic pulses radiated by partial discharges activity. The theoretic study of the band of frequencies in which the pulse emits and the measurement of the parameters S11 is complemented with the frequency response and wavelet transform of a set of 500 time signals acquiredby the antennas and the results are analyzed in detail. Keywords – Antenna measurements, dielectric measurements, partial discharges (PDs), UHF measurements, ultrahighfrequency (UHF) antennas, wavelets. M.V. Rojas, G. Robles, B. Tellini, C. Zappacosta, J.M. Martínez, J. Sanz. 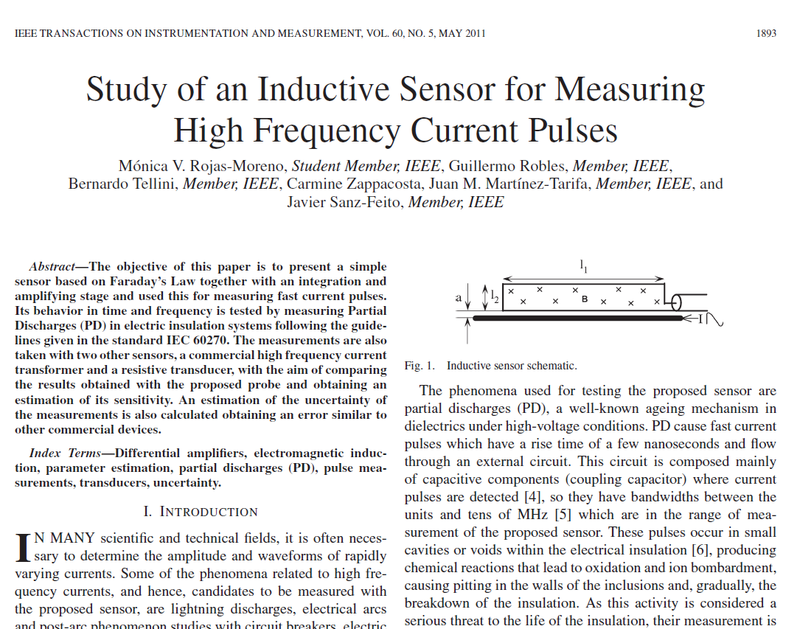 Study of an Inductive Sensor for Measuring High Frequency Current Pulses, IEEE Transactions on Instrumentation and Measurement, Vol 60, Issue 5, May. 2011 pp 1893-1900, http://dx.doi.org/10.1109/TIM.2010.2090056. Abstract – The objective of this paper is to present a simple sensor based on Faraday’s Law together with an integrating and amplifying stage and used for measuring fast current pulses. Its behavior in time and frequency is tested by measuring Partial Discharges (PD) in electric insulation systems following the guidelines given in the standard IEC 60270. The measurements are also taken with two other sensors, a commercial high frequency current transformer and a resistive transducer, with the aim of comparing the results obtained with the proposed probe and obtaining an estimation of its sensitivity. An estimation of the uncertainty of the measurements is also calculated obtaining an error similar toother commercial devices. Keywords – Differential amplifiers, electromagnetic induction, parameter estimation, partial discharges (PD), pulse measurements, transducers, uncertainty. Tellini, M. Marracci, C. Zappacosta, G. Robles. Critical parameters for mutual inductance between Rogowski coil and primary conductor, IEEE Transactions on Instrumentation and Measurement, Vol 60, Issue 2, Feb. 2011 pp 625-632. 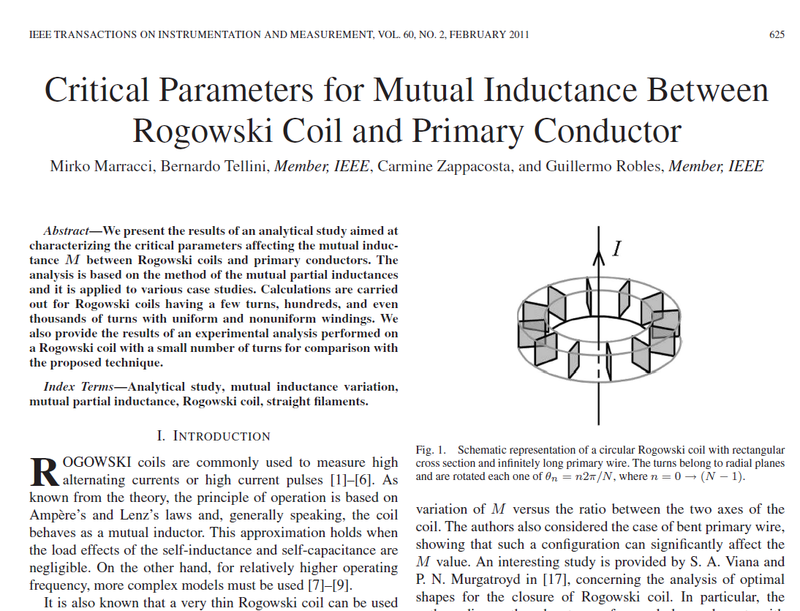 Abstract – We present the results of an analytical study aimed at characterizing critical parameters affecting the mutual inductance M between Rogowski coils and primary conductors. The analysis is based on the method of the mutual partial inductances and it is applied to various case studies. Calculations are carried out for Rogowski coils having a few turns, hundreds and even thousands of turns with uniform and nonuniform windings. We also provide results of an experimental analysis performed on a Rogowski coil with small number of turns for comparison with the proposed technique. G. Robles, J.M. Martínez, M.V. Rojas, J. Sanz. 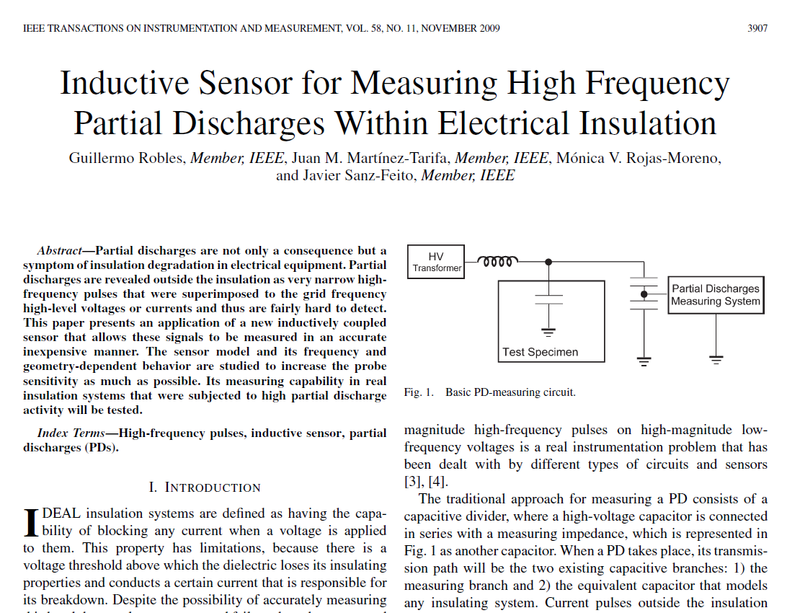 Inductive sensor for measuring high frequency partial discharges within electrical insulation, IEEE Transactions on Instrumentation and Measurement, Vol. 58, Issue 11, Nov. 2009, pp. 3907-3913. Abstract – Partial discharges are not only a consequence but a symptom of insulation degradation in electrical equipment. Partial discharges are revealed outside the insulation as very narrow, high frequency pulses, superimposed to the grid frequency high level voltages or currents, and thus fairly hard to detect. This paper presents an application of a new inductively coupled sensor that allows these signals to be measured in an accurate and inexpensive manner. The sensor model and its frequency and geometry dependent behavior are studied to increase the probe sensitivity as much as possible. Its measuring capability in real insulation systems subjected to high partial discharge activity will be tested. Keywords – Partial discharges, high frequency pulses, inductive sensor. 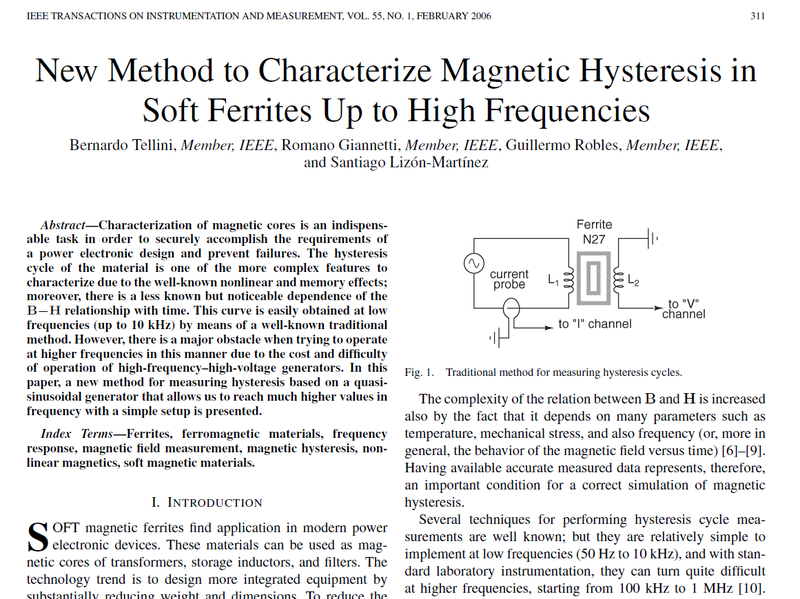 Abstract – An accurate measurement of the hysteresis cycle of magnetic cores is a crucial step in its characterization, due to the importance that its nonlinear and past-dependent effects can have on the correct operation in most electric and electronic circuits. 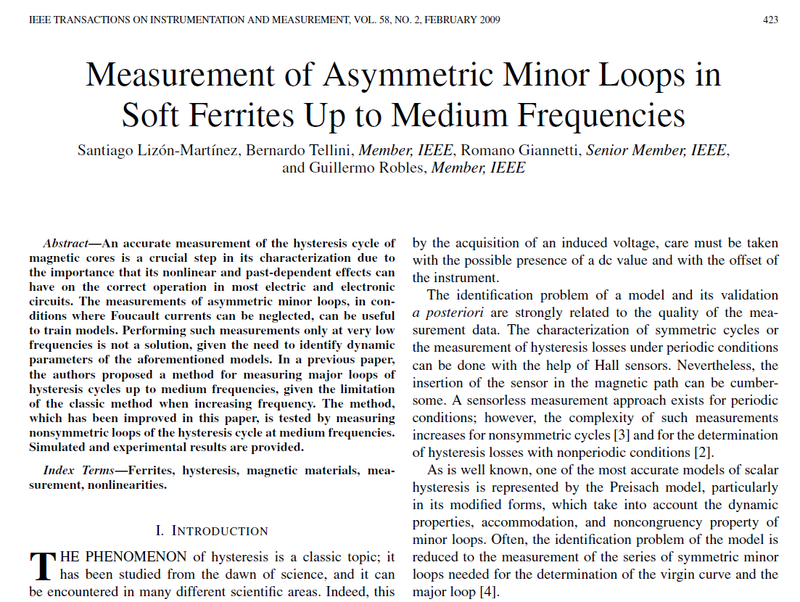 The measurements of asymmetric minor loops, in conditions where Foucault currents can be neglected, can be useful to train models. Performing such measurements only at very low frequencies is not a solution given the need to identify dynamic parameters of the aforementioned models. In a previous paper, the authors proposed a method for measuring major loops of hysteresis cycles up to medium frequencies given the limitation of the classic method when increasing frequency. The method, improved in this paper, is tested measuring non-symmetric loops of the hysteresis cycle at medium frequencies. Simulated and experimental results are provided. Abstract – Characterization of magnetic cores is an indispensable task in order to securely accomplish the requirements of a power electronic design and prevent failures. The hysteresis cycle of the material is one of the more complex features to characterize due to the well known non-linear and memory effects; moreover, there is a less known but noticeable dependence of the B-H relationship with time. This curve is easily obtained at low frequencies (up to 10kHz) by means of a well-known traditional method. However, there is a major obstacle when trying to operate at higher frequencies in this manner due to the cost and difficulty of operation of high frequency-high voltage generators. In this paper is presented a new method for measuring hysteresis based on a quasi-sinusoidal generator which allows us to reach much higher values in frequency with a simple setup. Keywords – Ferrites, ferromagnetic materials, frequency response, magnetif field measurements, magnetic hysteresis, nonlinear magnetics, soft magnetic materials. 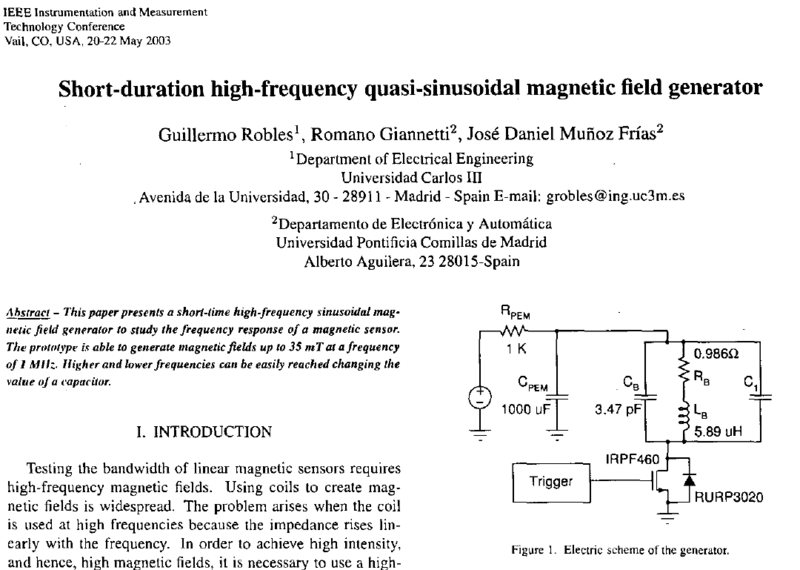 Abstract – This paper presents a short-time high-frequency sinusoidal magnetic field generator to study the frequency response of a magnetic sensor. The prototype is able to generate magnetic fields up to 35 mT at a frequency of 1 MHz. Higher and lower frequencies can be easily reached changing the value of a capacitor. Keywords – Frequency measurement, frequency response, magnetic field measurement, magnetic materials, magnetooptic effects, pulse generation, resonance. Abstract – The magnetooptic effect is due to a change in the polarization of the light when it is reflected or passes through a magnetized material. The rotation of the polarization plane is proportional to the magnetic field. The great advantage of using a magnetooptic sensor to measure intensity or magnetic fields is its wide bandwidth. This fact is widely known; however, no effective measurements have been taken. 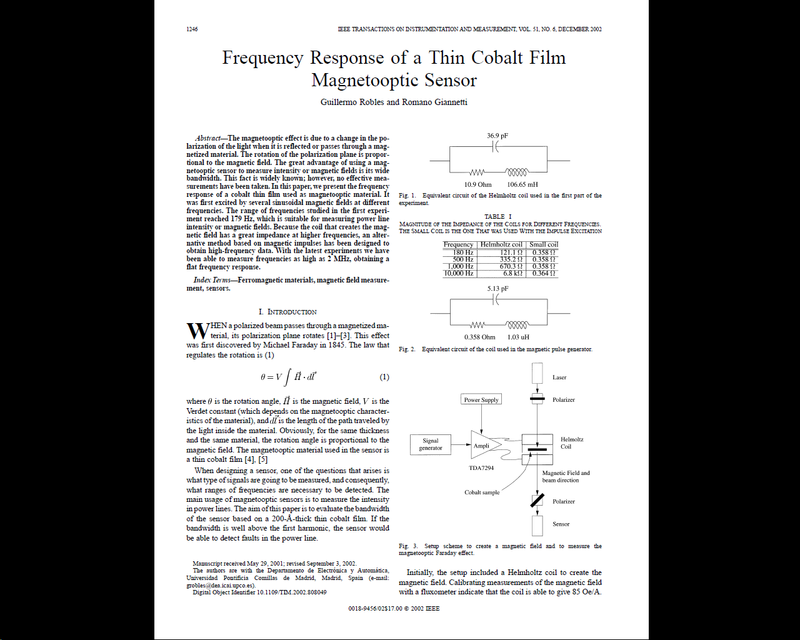 In this paper, we present the frequency response of a cobalt thin film used as magnetooptic material. It was first excited by several sinusoidal magnetic fields at different frequencies. The range of frequencies studied in the first experiment reached 179 Hz, which is suitable for measuring power line intensity or magnetic fields. Because the coil that creates the magnetic field has a great impedance at higher frequencies, an alternative method based on magnetic impulses has been designed to obtain high-frequency data. With the latest experiments we have been able to measure frequencies as high as 2 MHz, obtaining a flat frequency response. Keywords – Ferromagnetic materials, magnetic field measurement, sensors.